Copyright Jerry Clegg, no reproduction without permission. 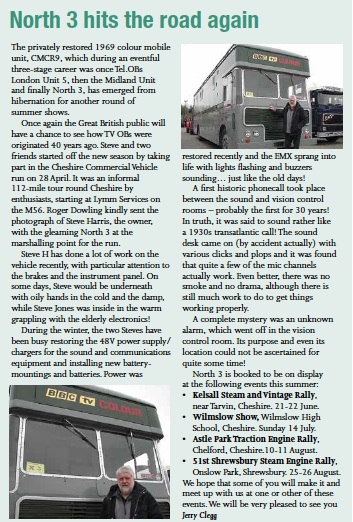 This article from the BBC retirees’ magazine, Prospero, by Jerry Clegg gives an update on the OB scanner CMCR9 – Pebble Mill’s original CM1, and later Manchester’s North 3. The scanner will be on display several more times this year, in case you would like to visit it, see the article for the details.